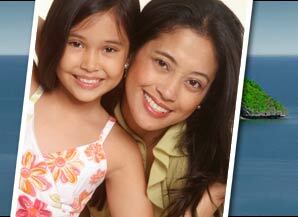 We have a complete line of children's dentistry services. We provide preventive measures as well as restorative procedures to maintain your childs smile. Prevention is always better than cure. Our routine dental check up includes oral prophylaxis and fluoride treatment. We also do sealants and preventive resin restoration for the molars. An early visit to a dentist can predict orthodontic problems. We refer to our orthodontist partner for further evaluation and treatment. In an unrestorable tooth, our last resort is extraction. Should we need to extract the tooth, we provide space maintainer to prevent the loss of space for the permanent teeth. Don't take for granted your child's appearance after the early loss of his baby front teeth. This may cause speech defect and insecurities. We make beautiful baby dentures to bring back the smile in your child.
" A great dental experience for my daughter and me "